The Bulletin contains information that throws light on methodological, scientific and educational work at National Transport University. It is aimed to enhance operating efficiency of all modes of transport, the road infrastructure of Ukraine and to train highly qualified specialists in this field. Furthermore, there are materials describing how to organize and conduct educational process using the latest information technologies and ECM as well as results of fundamental and applied research and current development of scientific problems in the field of road transport and transport construction, training of academic staff at postgraduate and doctoral levels, reviews of scientific and methodological conferences that take place at NTU and outside its walls, latest news at the University. phone: (044) 280-01-49; (044) 284-26-26. The scientific journal articles are devoted to the development of scientific bases, models, methods and algorithms of system analysis and logistics within the enhancement projects of industrial, economic, financial and social activities of transport enterprises and to the search of advanced manufacturing technologies, rolling stock operation and maintenance under current conditions. Specialized registration in State Attestation Commission (SAC) of Ukraine: According to the Directive of the Ukraine Higher Attestation Commission (HAC) from 10.02.2010 № 1-05/1 the scientific journal of Projects Management, System Analysis and Logistics is included in the List of Scientific Publications of HAC, where main results of dissertations for doctor or candidate of engineering or economic sciences degrees can be published. The scientific journal of Projects Management, System Analysis and Logistics is available in abstract databases: Science Index, e-Library. Specialties according to SAC: 05.13.06 – Information Technologies, 05.13.22 – Projects and Programs Management, 05.22.01 – Transport Systems, 05.22.02 – Vehicles and Tractors, 05.22.11 – Roads and Airfields, 05.22.20 – Vehicles Operation and Maintenance, 05.23.17 – Structural Mechanics, 05.05.03 – Engines and Power Stations, 05.02.04 – Friction and Wear in Machines, 08.00.03 – National Economics and Management, 08.00.04 – Economics and Company Management (by the Type of Economic Activity), 08.00.05 – Production Forces Development and Regional Economics, 08.00.11 – Mathematical Methods, Models and Information Technologies in Economics. M.F. Dmytrychenko , Doctor of Engineering Sciences, Professor(Chair); M.М. Dmytriev, Doctor of Engineering Sciences, Professor(Deputy Chair); V.М. Hurnak, Doctor of Economic Sciences, Professor; T.A. Vorkut, Doctor of Engineering Sciences, Professor; Y.S. Hrysiuk, Candadate of Economic Sciences, Associate Professor (Secretary). M.F. Dmytrychenko, Doctor of Engineering Sciences, Professor (Chief Editor), NTU; M.М. Dmytriev, Doctor of Engineering Sciences, Professor (First Deputy Chief Editor), NTU; V.М. Hurnak, Doctor of Economic Sciences, Professor (Deputy Chief Editor), NTU; T.A. Vorkut, Doctor of Engineering Sciences, Professor, (Deputy Chief Editor), NTU; А.V. Bazyliuk, Doctor of Economic Sciences, Professor NTU; Y.V. Bondarenko, Doctor of Economic Sciences, Professor, NTU; М.N. Bidniak, Doctor of Engineering Sciences, Professor, NTU; А.P. Hrechan, Doctor of Economic Sciences, Professor. NTU; V.D. Danchuk, Doctor of Physical and Mathematical Sciences, Professor, NTU; V.V. Havrylenko, Doctor of Physical and Mathematical Sciences, Professor, NTU; Y.F. Hutarevych, Doctor of Engineering Sciences, Professor, NTU; О.P. Levkivskyi, Doctor of Engineering Sciences, Professor, NTU; V.P. Mateichyk, Doctor of Engineering Sciences, Professor, NTU; D.О. Pavliuk, Doctor of Engineering Sciences, Professor, NTU; H.S. Prokudin, Doctor of Engineering Sciences, Professor, NTU; E.K. Posviatenko, Doctor of Engineering Sciences, Professor, NTU; V.Y. Savenko, Doctor of Engineering Sciences, Professor, NTU; V.P. Sakhno, Doctor of Engineering Sciences, Professor, NTU; N.I. Bohomolova, Doctor of Economic Sciences, Professor, State Economy and Technology University of Transport; А.М. Novikova, Doctor of Economic Sciences, Professor, State Road Transport Research and Design Institute; H.M. Kuharionok, Doctor of Engineering Sciences, Professor, Belarusian National Technical University, (Belarus); М.H. Shatrov, Doctor of Engineering Sciences, Professor, Moscow Automobile and Road Construction State Technical University (MADI), (Russia); Prof. Dr. Klaus Rosenthal, University of Paderborn, Germany; Prof. Dr. Richard Fortmyuller, Vienna University of Economics and Business Administration, Austria; Dr. Guido Kaufmann, University of Paderborn, Germany; Dr. Vyacheslav Nikitin, University of Paderborn, Germany; Prof. Dr. Sc. Jana Kucerova, Matej Bel University, Banska Bystrica, Slovakia; Dr. Sc. Miroslaw Smieszek, Rzeszowska Politechnika, Poland; Prof.Dr. Sc. Kazimirz Lejda, Rzeszowska Politechnika, Poland. Certificate of state registration of the Journal – series КV № 9784 dated April 21, 2005, issued by the State Committee for Television and Radio Broadcasting of Ukraine. 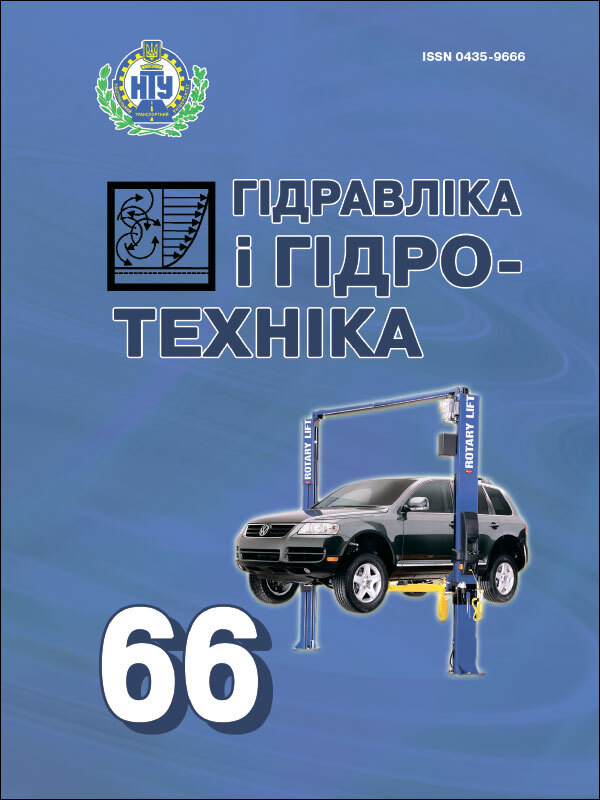 The aim of the publication of The Scientific and Technical Journal “Automobile Roads and Road Construction” – the coverage of the results of theoretical and experimental research in the fields of exploration, designing roads and transitions through watercourses; road building materials and products; construction and maintenance of roads and airfields; economy of road construction production, technical expertise and property valuation; construction mechanics and system analysis; transport constructions; transport technologies and traffic safety; road construction machinery and production base of construction; ecology and environment protection, etc. The Journal is for scientists, employees of research institutes, design and construction organizations, as well as university lecturers and students. Printed copies are distributed among: state and leading libraries of Ukraine, leading educational, scientific, research and design institutions of road transport; enterprises for the construction, reconstruction, repair and maintenance of highways and airfields; institutions in which must send the publications with published main results of the dissertation work (the order of the Ministry of Education and Science of Ukraine dated July 11, 2016 No. 820 is included in the List of scientific professional editions of Ukraine). 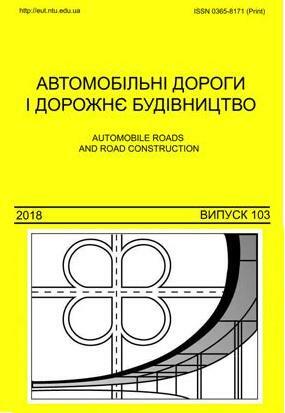 The Scientific and Technical Journal “Automobile Roads and Road Construction” is published according to the decision of the Academic council of the National transport university. Chief Editor: Viacheslav Ya.Savenko, Dr.Sci.Tech. (Dr. of Techn. Sciences), Professor. Deputy Chief Editor: Olena S. Slavinska, Dr.Sci.Tech. (Dr. of Techn. Sciences), Professor. Responsible secretary of the editorial board: Volodymyr V. Petrovich, PhD (Candidate of Technical Sciences), Senior Researcher, Professor. Editorial board: Savenko V., Dr.Sci.Tech., Professor (Chief Editor); Slavinska O., Dr.Sci.Tech, Professor (Deputy Chief Editor); Batrakova A., Dr.Sci.Tech., Professor, KhNADU (Kharkiv); Bondarenko E., Dr.Sci. in Geography, Professor, NTU (Kyiv); Bondarenko L., PhD (Cand. of Techn. Sciences), Associate Professor, NTU (Kyiv); Bilokon A., Dr.Sci.Tech., Professor, PDABA (Dnipropetrovsk); Vnukova N., Dr.Sci.Tech., Professor, KhNADU (Kharkiv), Vorkut T., Dr.Sci.Tech., Professor, NTU (Kiev); Havrilenko V., Dr.Sci.Phys.-math., Professor, NTU (Kyiv); Hameliak I., Dr.Sci.Tech., Professor, NTU (Kyiv); Honcharenko F., PhD (Cand. of Techn. Sciences), Associate Professor, State Enterprise “Ukrdiprodor” (Kyiv); Gulyaev V., Dr.Sci.Tech., Professor, NTU (Kiev); Zhdaniuk V., Dr.Sci.Tech., Professor, KhNADU (Kharkiv); Zolotarov V., Dr.Sci.Tech., Professor, KhNADU (Kharkiv); Kaskiv V., PhD (Cand. of Techn. Sciences), Associate Professor, NTU (Kyiv); Kirichek Yu., Dr.Sci.Tech., Professor, PDABA (Dnipropetrovsk); Kiiashko I., PhD (Cand. of Techn. Sciences), Associate Professor, KhNADU (Kharkiv); Kovalchuk V., Dr.Sci.Tech., Senior Researcher, Professor, Institute of Water Problems and Melioration of NAAN of Ukraine (Kyiv); Kuzlo M., Dr.Sci.Tech., Professor, NUVGP (Rivne); Lantukh-Liashchenko A., Dr.Sci.Tech., Professor, NTU (Kyiv); Loza I., Dr.Sci.Phys.-math., Professor, NTU (Kyiv); Liashenko D., Dr.Sci. in Geography, Associate Professor, NTU (Kyiv); Mamonov K., Dr.Sci.Econ., Professor, Kharkiv National University of Municipal Economy named after O. Beketov (Kharkiv); Marchuk O., Dr.Sci.Tech., Professor, NTU (Kyiv); Mateichyk V., Dr.Sci.Tech., Professor, NTU (Kyiv); Mishutin A., Dr.Sci.Tech., Professor, ODABA (Odesa); Mohilnyi S., Dr.Sci.Tech., Professor, PDABA (Dnipropetrovsk); Mozghovyi V., Dr.Sci.Tech, Professor, NTU (Kyiv); Nahaichuk V., PhD (Cand. of Techn. Sciences), Associate Professor, State Enterprise “DerzhDORNDI” (Kyiv); Pavliuk D., Dr.Sci.Tech., Professor, NTU (Kyiv); Romanenko V., Dr.Sci.Tech., Professor, KPI named after Igor Sikorsky (Kyiv); Smirnova N., Dr.Sci.Tech., Professor, KhNADU (Kharkiv); Snisarenko V., Dr.Sci.Tech., Professor, Research Institute “PIDZEMSPETSBUD” (Kyiv); Sokolova N., PhD (Cand. of Economic Sciences), Associate Professor, NTU (Kyiv); Solodkyi S., Dr.Sci.Tech., Professor, National University “Lviv Polytechnic” (Lviv); Trifonov I., Dr.Sci.Tech., Professor, PDABA (Dnipropetrovsk); Usychenko O., PhD (Cand. of Techn. Sciences), Associate Professor, NTU (Kyiv); Fainleib O., Corresponding Member of the National Academy of Sciences, Dr.Sci. in Chemistry, Professor, Institute of Macromolecular Chemistry, National Academy of Sciences of Ukraine (Kyiv); Kharchenko A., PhD (Cand. of Techn. Sciences), Associate Professor, NTU (Kyiv); Khrutba V., Dr.Sci.Tech., Professor, NTU (Kyiv); Chechuha O., PhD (Cand. of Techn. Sciences), Associate Professor, NTU (Kyiv); Shmatkov G., Dr.Sci. in Biology, Professor, PDABA (Dnipropetrovsk). International Council: Lev Khazanovich, Professor at University of Pittsburgh (USA), Renata Kotynia, Prof. PŁ, Lodz University of Technology (Poland), Carlo Giavarini, Prof. Full professor of Industrial and Technological Chemistry (Italia), Riheb Hadji, PhD (Algeria), Ferhat Hammoum, Directeur du laboratoire Matériaux pour les Infrastructures de Transport (France), Younes Hamed, Ph.D., Associate Professor, Faculty of Science of Gafsa FSGF Department of Earth Sciences (Tunisia), Teltayev B., Dr.Sci.Tech., Professor (Kazakhstan), Bozho Soldo, PhD (Croatia), Wen Mingming, PhD (China), Daniela Durcanska, Prof. University of Zilina (Slovakia). Editorial Council: V. Savenko (Chairman), O. Slavinska (Deputy Chairman), V. Petrovych (Secretary), I. Hameliak, V. Kaskiv, O. Usychenko, O. Chechuha. The scientific and technical journal describes results of theoretical and experimental studies within the following fields: investigation, design, construction, reconstruction and maintenance of roads and water courses; constructive and underground transport facilities; manufacturing enterprises; an organizational basis and economics of construction operations and road-building industry development; ecology and the environment protection; road conditions and safety; engineering mechanics of transport structures, etc. Specialized registration in State Attestation Commission (SAC) of Ukraine: The journal is defined as the specialized publication according to the Directive of the Ukraine Higher Attestation Commission (HAC) № 1-05/3 from 14. 04. 2010. Members of editorial board: V.Y. Savenko (Chair), О.S. Slavinska (Deputy Chair), V.V. Petrovych (Secretary), I.P. Hameliak, V.I. Kaskiv. Members of editorial team: V.Y. Savenko, Doctor of Engineering Sciences (chief editor), NTU (Kyiv); О.S. Slavinska, Doctor of Engineering Sciences (deputy chief editor), NTU (Kyiv); V.V. Petrovych, Cand. of Engineering Sciences (secretary), NTU (Kyiv); V.І. Bratchun, Doctor of Engineering Sciences, Donbas National Academy of Civil Engineering and Architecture (Kramatorsk); І.P. Hameliak, Doctor of Engineering Sciences, NTU (Kyiv); F.P. Honcharenko, Candidate of Engineering Sciences,Ukrdiprodor (Kyiv); V.K. Zhdaniuk, Doctor of Engineering Sciences, Kharkiv National Automobile and Highway University (KhNAHU); V.О. Zolotariov, Doctor of Engineering Sciences, KhNAHU (Kharkiv); V.І. Kaskiv, Candidate of Engineering Sciences, NTU (Kyiv); Y.O. Kirichek, Doctor of Engineering Sciences, Prydniprovska State Academy of Civil Engineering and Architecture (PSACEA) (Dnipro); І.V. Kiyashko, Candidate of Engineering Sciences, KhNAHU (Kyiv); М.T. Kuzlo, Doctor of Engineering Sciences, National University of Water and Environmental Engineering (Rivne); H.Y. Lypskyi, Candidate of Engineering Sciences, NTU (Kyiv); О.V. Marchuk, Doctor of Engineering Sciences, NTU (Kyiv); V.P. Mateichyk, Doctor of Engineering Sciences, NTU (Kyiv); А.V. Mishutin, Doctor of Engineering Sciences, Odessa State Academy of Civil Engineering and Architecture (Odessa); V.V. Mokhhovyi, Doctor of Engineering Sciences, NTU (Kyiv); V.M. Nahaichuk, Candidate of Engineering Sciences, DerzhdorNDI (Kyiv); D.О. Pavliuk, Doctor of Engineering Sciences, NTU (Kyiv); О.О. Rasskazov, Doctor of Engineering Sciences, NTU (Kyiv); S. Y. Solodkyi, Doctor of Engineering Sciences, Lviv Polytechnic National University (Lviv); Y B. Uhnenko, Doctor of Engineering Sciences, KhNAHU (Kharkiv); О.Y. Usychenko, Candidate of Engineering Sciences, NTU (Kyiv). Chief Editor: Mykola Dmytrychenko, Doctor of Engineering Sciences, Professor. Certificate of the journal registration: Series KV № 9785 dated 21.04.2005, issued by the State Television and Radio Broadcasting Committee of Ukraine. Dadenkov V.Yu., Candidate of Engineering Sciences; Eremenko Ye.V., Candidate of Engineering Sciences; Kryl S.I., Candidate of Engineering Sciences; Slavinska O.S., Doctor of Engineering Sciences; Cherniuk V.V., Candidate of Engineering Sciences; Vasilenko O.A., Candidate of Engineering Sciences; Yahno A.M., Candidate of Engineering Sciences; Khlopuk M.M., Candidate of Engineering Sciences. 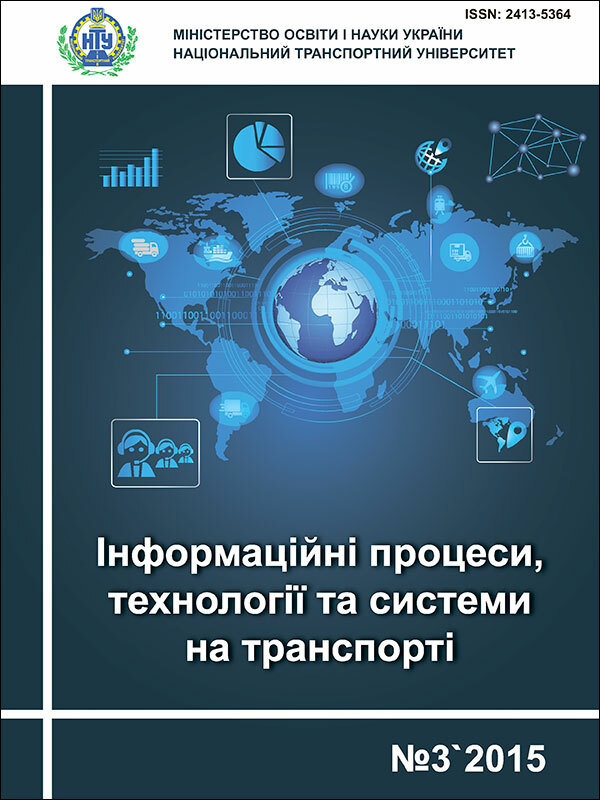 The materials published in the scientific journal of Information Processes, Technologies and Transport Systems highlight the main results of research and scientific and technical work aimed at developing and improving information processes, technologies and systems to enhance the efficiency of all transport modes and the infrastructure of road complex in Ukraine and other countries. V.D. Danchuk, Doctor of Physical and Mathematical Sciences, Professor; V.V. Havrylenko, Doctor of Physical and Mathematical Sciences, Professor; T.A. Vorkut Doctor of Engineering Sciences, Professor; V.P. Polischuk, Doctor of Engineering Sciences, Professor; G.S. Prokudin, Doctor of Engineering Sciences, Professor; O.L. Petrashevskyi, Doctor of Engineering Sciences, Professor; G.L. Baranov, Doctor of Engineering Sciences, Professor; R.A. Habutdinov, Doctor of Engineering Sciences, Professor; O.I. Melnychenko, Candidate of Engineering Sciences, Professor; M.M. Stepanov, Candidate of Engineering Sciences, Senior Research Fellow; O.M. Trofimchuk, Doctor of Engineering Sciences, Professor, Institute of Telecommunications and Global Information Space of NAS of Ukraine; T.O. Prymak, Doctor of Economic Sciences, Professor, Vadym Hetman Kyiv National Economic University; O.L. Liakhov, Doctor of Engineering Sciences, Professor, Poltava National Technical University named after Yurii Kondratiuk; A.A. Tymchenko, Doctor of Engineering Sciences, Professor, Cherkassy State Technological University; V.G. Riabtsev, Doctor of Engineering Sciences, Professor, European University, Cherkassy branch; V.E. Snytiuk, Doctor of Engineering Sciences, Professor, the Taras Shevchenko National University of Kyiv; O.G. Korchenko, Doctor of Engineering Sciences, Professor, National Aviation University; A.V. Haidachuk, M.E., Doctor of Engineering Sciences, Professor, Zhukovskyi National Aerospace University; A. P. Marchenko, Doctor of Engineering Sciences, Professor, National Technical University: Kharkiv Polytechnic Institute; Yu.M. Teslia, Doctor of Engineering Sciences, Professor, the Taras Shevchenko National University of Kyiv; O.G. Oksiiuk, Doctor of Engineering Sciences, Professor, the Taras Shevchenko National University of Kyiv; V.V. 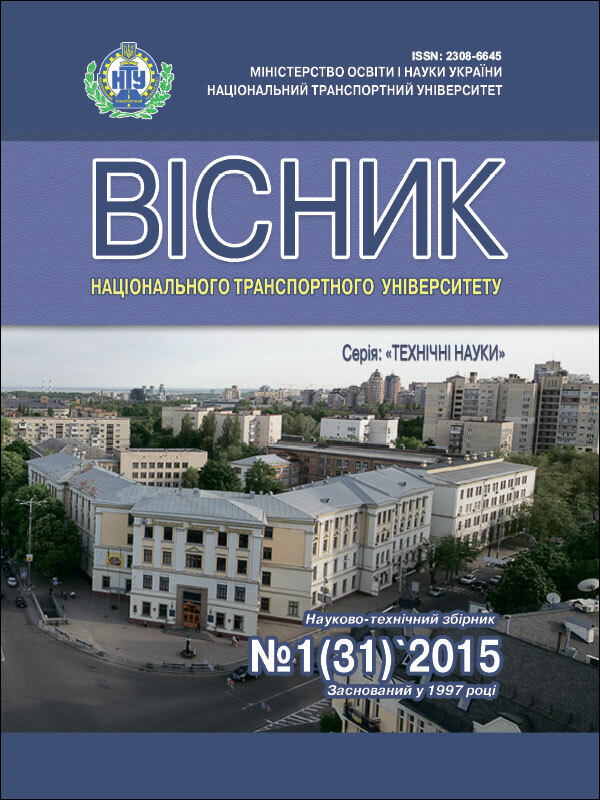 Bilichenko, Doctor of Engineering Sciences, Professor, Vinnitsa National Technical University; V.S. Kharchenko, M.E., Doctor of Engineering Sciences, Professor, Zhukovskyi National Aerospace University; D.D. Peleshko, Doctor of Engineering Sciences, Professor, National University: Lviv Polytechnika; V.Ya. Nehrey, Doctor of Engineering Sciences, Professor, Belarusian State University of Transport, Belarus; M.G. Shatrov, Doctor of Engineering Sciences, Professor, Moscow Automobile and Road State Technical University, Russia; H.M. Kuharionok, Doctor of Engineering Sciences, Professor, Belarusian National Technical University, Belarus; Prof Dr. Klaus Rosenthal, University of Paderborn, Germany; Prof. Dr Richard Fortmyuller, Vienna University of Economics and Business Administration, Austria; Dr. Guido Kaufmann, University of Paderborn; Dr. Vyacheslav Nikitin, University of Paderborn, Germany; Prof Dr. Jana Kucerova, Matej Bel University, Banska Bystrica, Slovakia; Prof. Dr. Miroslaw Smieszek, Rzeszowska Politechnika, Poland; Prof. Dr. Kazimirz Lejda, Rzeszowska Politechnika, Poland. Tel. (044) 280-01-49; (044) 284-26-26. Certificate of registration: Series KV № 21289-11089P dated 26.03.2015, issued by the State Registration Service of Ukraine. 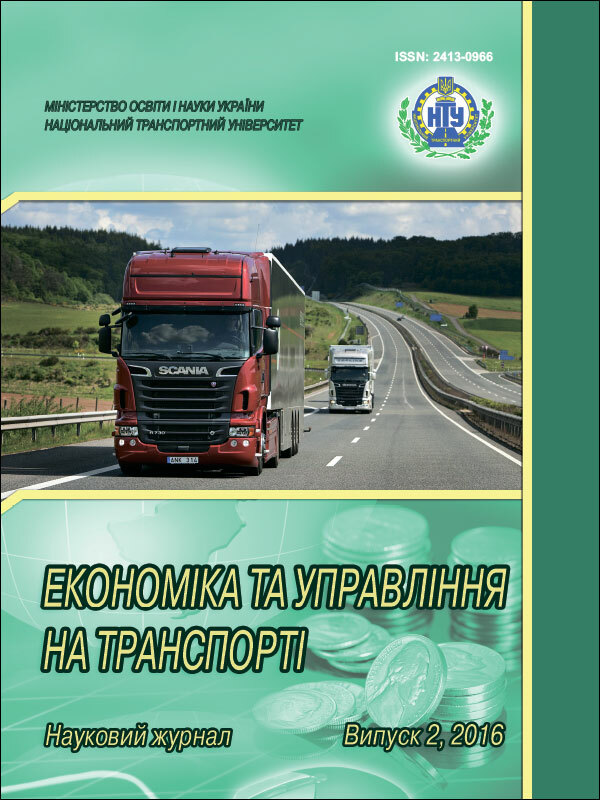 The materials published in the scientific journal of Economics and Transport Management highlight research results in reforming certain forms of transport, optimizing the processes and production and business activities of the road transport complex of Ukraine and other countries, the development of principles and methods of business management to enhance their competitiveness in the domestic and international markets. The journal is a valuable source of information for practitioners and researchers in the field of economy and transport management as it facilitates sharing of knowledge, research results and ideas in this area. 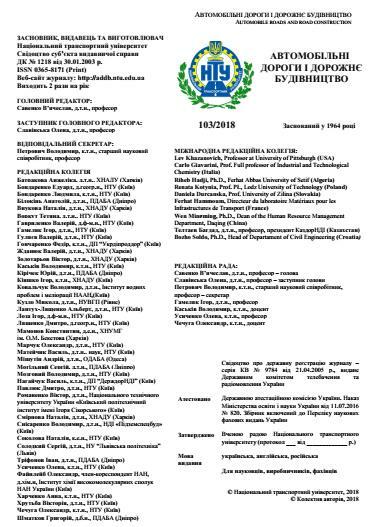 By the Ministry of Education and Science of Ukraine Order № 820 dated 11.07.2016, the scientific journal of Economics and Transport Management is included in the list of scientific professional publications of Ukraine, where the results of dissertations for the degree of doctor or candidate of sciences can be published (branch of science – Economics). Bakulich O.O., Candidate of Engineering Sciences, Professor, NTU; Bondarenko Ye.V., Doctor of Economic Sciences, Professor, NTU; Kozak L.S., Candidate of Economic Sciences, Professor, NTU; Bazyliuk A.V., Doctor of Economic Sciences, Professor, NTU; Vorkut T.A., Doctor of Engineering Sciences, Professor, NTU; Hrechan A., Doctor of Economic Sciences, Professor, NTU; Bondar N.M., Doctor of Economic Sciences, Professor, NTU; Parfentseva N.O., Doctor of Economic Sciences, Professor, National Academy of Statistics, Accounting and Auditing; Eitutis G.D., Doctor of Economic Sciences, Professor, State Economic and Technological University of Transport; Lozhachevska A.M., Doctor of Economic Sciences, Professor, National Aviation University; Holubkov I.A., Doctor of Economic Sciences, Professor, Odessa National Maritime Academy; Prymak T.O., Doctor of Economic Sciences, Professor, Vadym Hetman Kyiv National Economic University; Chmelewskyi M.O., Candidate of Economic Sciences, Professor, NTU; Chesnakova L.S., Candidate of Economic Sciences, Professor, NTU; Omelianovych O. R., Candidate of Economic Sciences, Associate Professor, NTU; Siedoi V.G., Candidate of Economic Sciences, Associate Professor, NTU; Boyko V.V., Candidate of Economic Sciences, Associate Professor, NTU; Hrysiuk Yu.S., Candidate of Economic Sciences, Associate Professor, NTU; Prof. Dr. Klaus Rosenthal, University of Paderborn, Germany; Prof. Dr. Richard Fortmyuller, Vienna University of Economics and Business Administration, Austria; Dr. Guido Kaufmann, University of Paderborn, Germany; Dr. Vyacheslav Nikitin, University of Paderborn, Germany; Prof. Dr. Jana Kucerova, Matej Bel University, Banska Bystrica, Slovakia; Prof. Dr. Miroslaw Smieszek, Rzeszowska Politechnika, Poland; Prof. Dr. Kazimirz Lejda, Rzeszowska Politechnika, Poland; Prof. Dr. Harald Pechlaner, Institute for Regional Development and Location Management at the European Academy of Bozen–Bolzano, Italy; Prof. Dr. Niko Kvaratskelia, Tbilisi State University of Economic Relations, Georgia; Prof. Dr. Lela Kelbakiani, Kutaisi University of Law and Economics, Georgia; Prof. Dr. Ivan Dadi’c, University of Zagreb, Croatia. Editorial board secretary: Fedoruk Olesia Volodymyrivna, Candidate of Economic Sciences, Associate Professor.